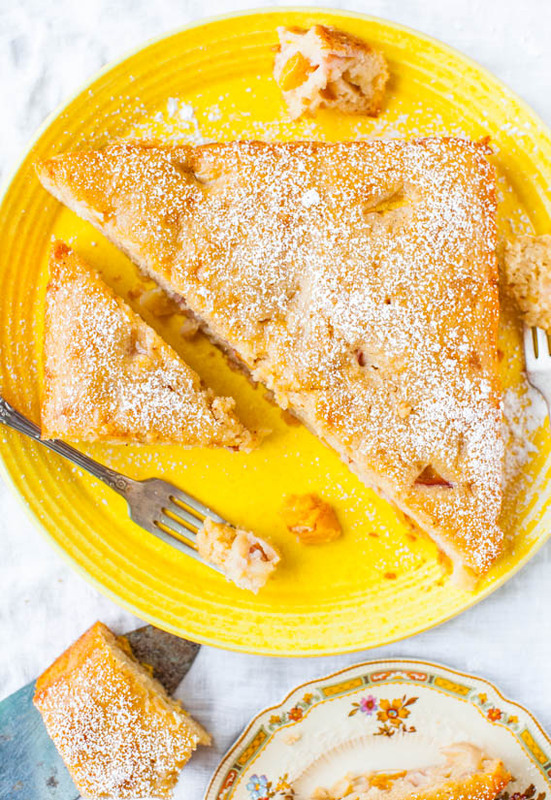 This cake tastes like a big, soft, fluffy, peach muffin. 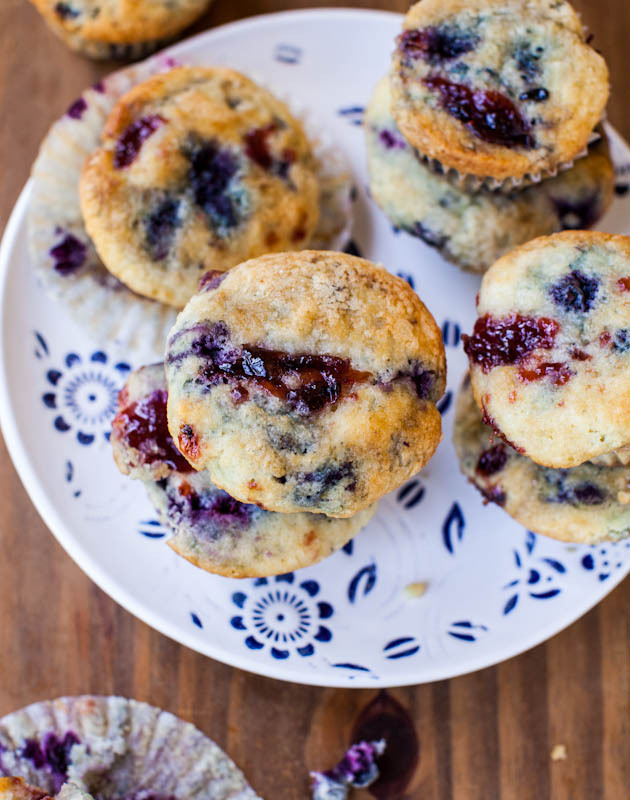 But making a cake is so much easier than making individual muffins, and I’m all for ease. 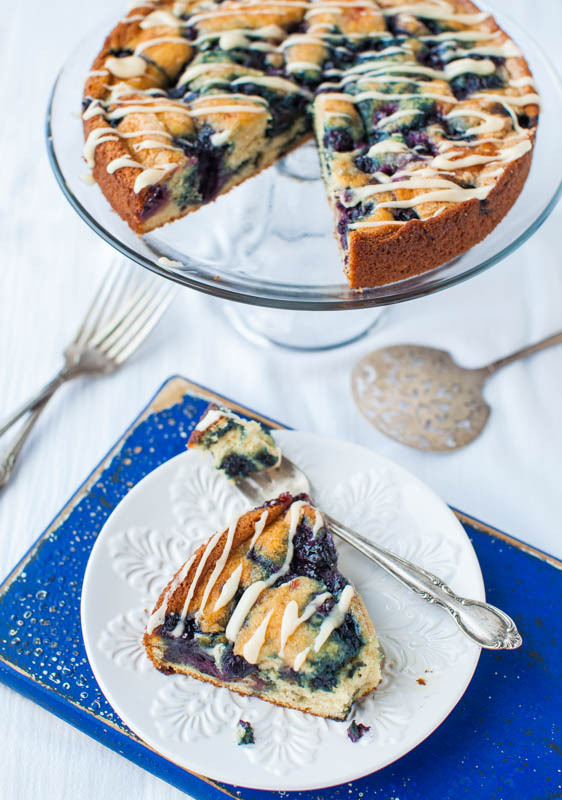 The cake is a spinoff on the Blueberry Muffin and Buttermilk Pancakes Cake I made last week. 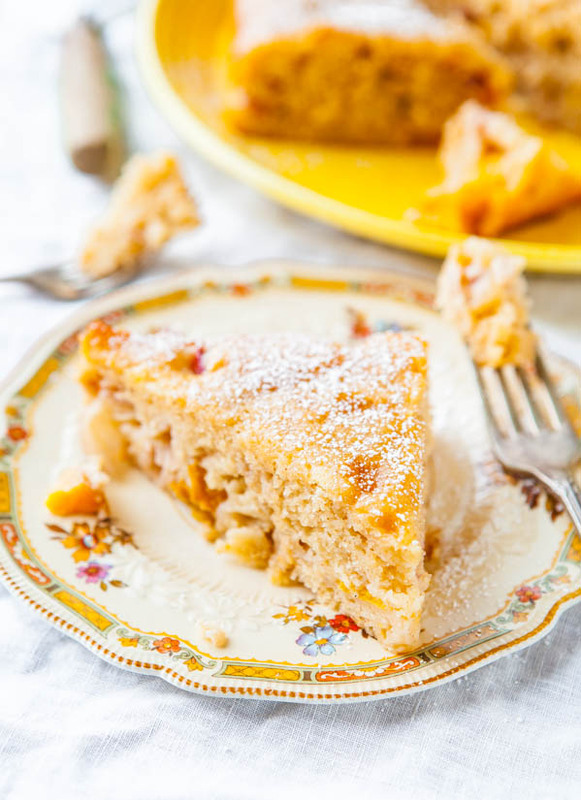 I loved that little cake so much, and when I noticed a countertop full of ripe peaches and nectarines, I knew I had to bake them into a cake. The cake batter comes together in 5 minutes without a mixer. Nothing complicated, fussy, or time-consuming. It’s standard muffin batter with a bowl of dry ingredients and a bowl of wet. Pour the wet over the dry, stir in the fruit, pour into a pan, and bake. I used one white peach and one nectarine, but feel free to mix and match with your favorites like apricots, plums, pluots, and plucots. I love all the fruit hydrids that come into season this time of year. I’m counting down the days to persimmons season. I used fresh fruit rather than frozen like last time, and about 15 minutes was shaved off the baking time. Baking times will range based on how juicy your fruit is, but I would estimate 35 to 40 minutes. Watch your cake, not the clock, when determining if the fluffy little number is done. For me this was a sub 45-minute start-to-finish cake. 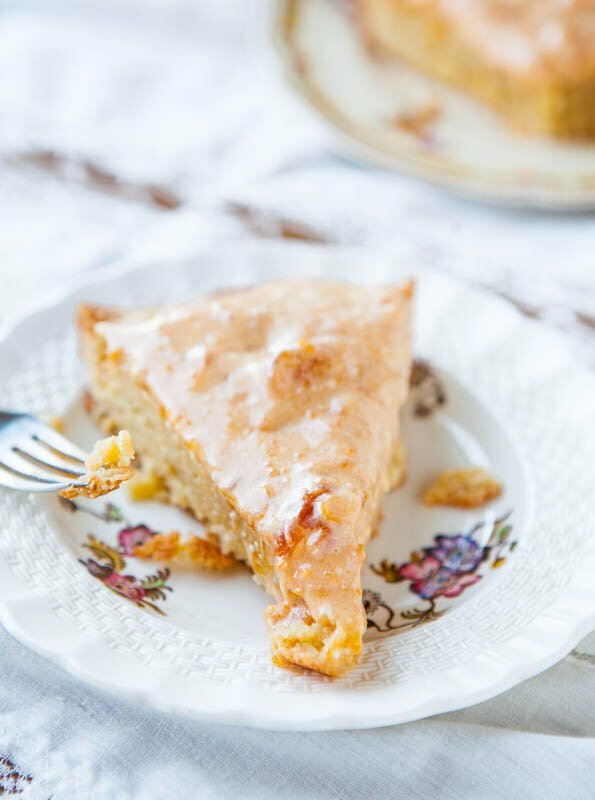 The quicker I can get tender, falling-apart-soft cake into my belly, the happier I am. 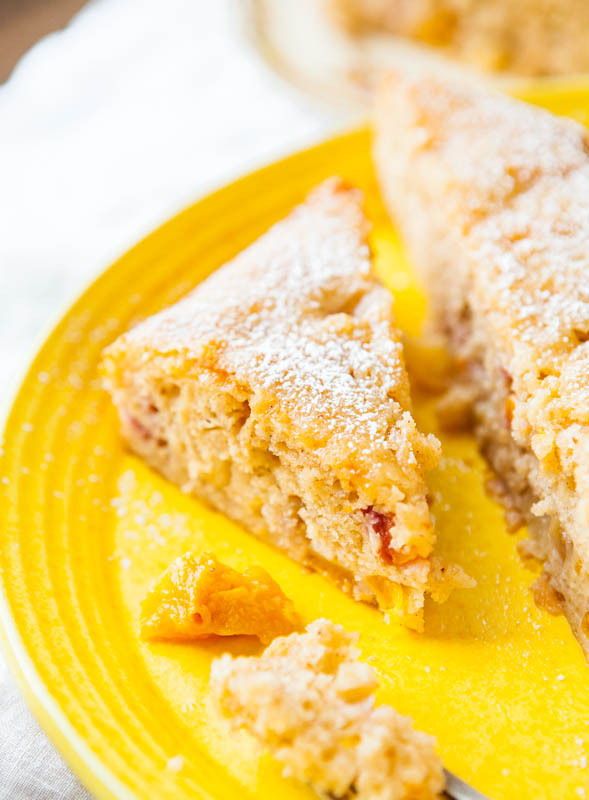 With 2 cups of fruit, and just over 1 cup of flour, this cake is very heavy on the juicy, succulent fruit, and it stays supremely moist. There’s also sour cream, buttermilk, and oil to help keep it tender and soft. 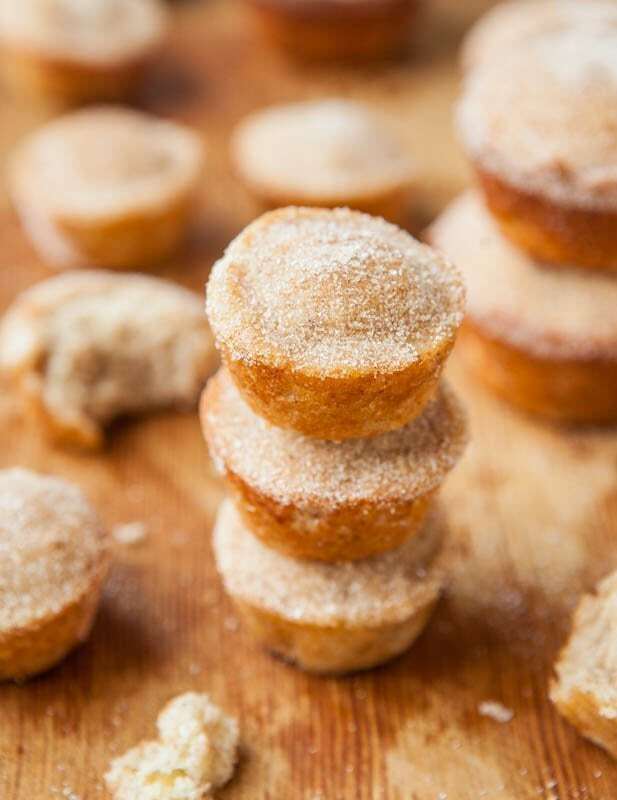 The crumb is light and fluffy like a delicate muffin with just enough density from the fruit to be so satisfying. It’s the kind of cake you keep chipping away at to straighten the rows. 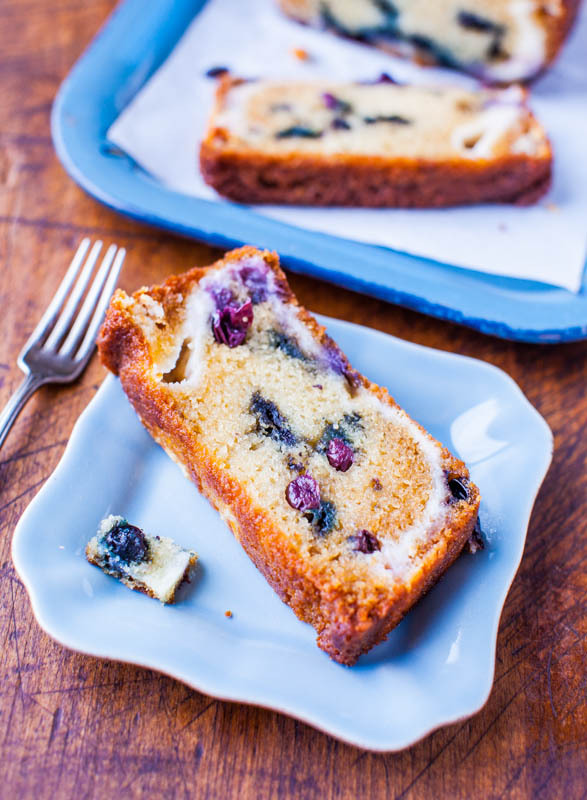 It’s perfect for brunches, special events, or as a small everyday-cake, which takes advantage of seasonal fruit. You know, all that fruit you buy because it all looks so good at the store, and then all that fruit all ripens on the same day. And you’re left scrambling and wondering what to do with it. 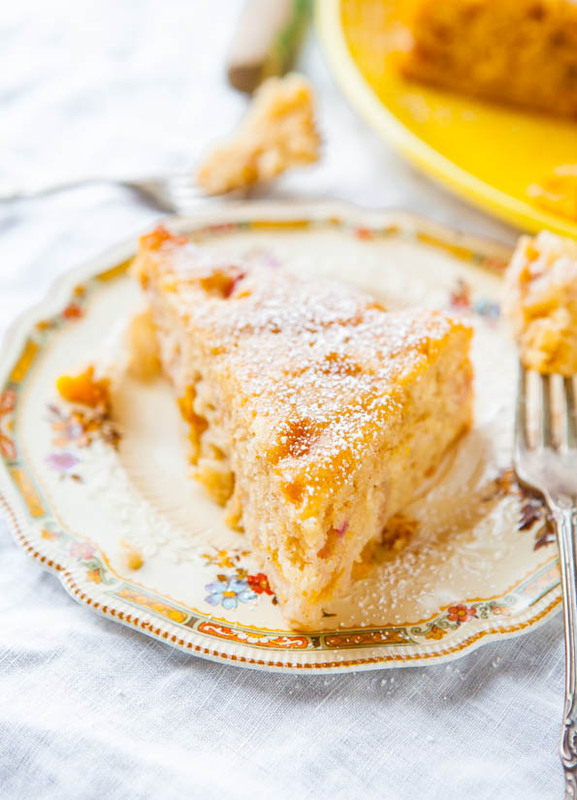 This cake tastes like one big, soft, fluffy, peach muffin. It’s ridiculously moist, tender, and falling-apart soft. The batter comes together in minutes without a mixer. Baking one cake is faster than making individual muffins, and this is a great cake when you’re short on time. 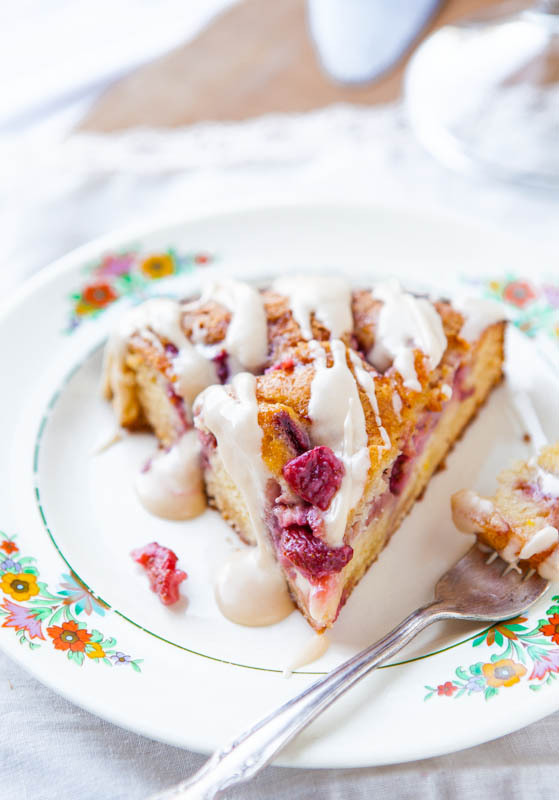 It’s perfect for brunches, special events, or as a small everyday-cake, taking advantage of seasonal fruit. Feel free to mix and match with your favorites like nectarines, apricots, or plums. Bake until done, probably 35 to 40 minutes, but watch your cake, not the clock. Bake until center is slightly domed and set, golden in color, and a toothpick inserted in the center comes out clean or with a few moist crumbs, but no batter. At any time your cake is beginning to look a bit too golden brown before you suspect the center will set up, tent it with a sheet of foil laid across the top. I baked for 37 minutes total, and at the 30 minute mark, I tented with foil. Baking times will range dramatically based on types of fruit used, how juicy it is, and how much water it releases into the batter. What summer fruits have you been enjoying? 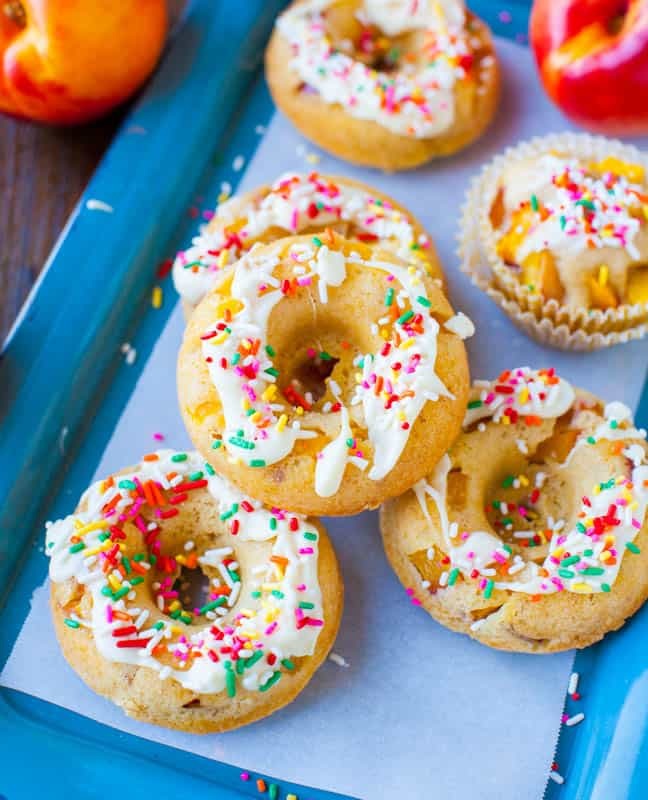 Favorite summer dessert recipes using fruit? So very pretty! All of these pictures! I haven’t eaten sugar in 11 years and these pictures fill that void! Okay, call me crazy but I’m not a peach fan.. like at all. 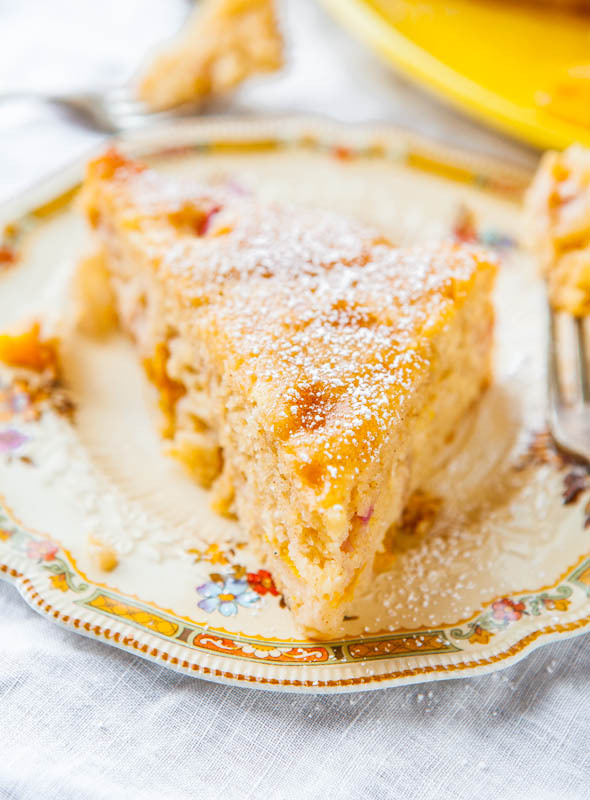 However, I am a fan of cake, muffins, sugar, and anything you make, so therefore, I’m willing to put my indifference with peaches aside and devour half this cake in about five minutes flat. 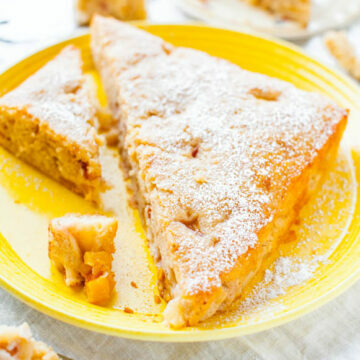 I love peach desserts. Or breakfasts! I am waiting for peaches to get extra ripe around here to make a peach dessert for my cookbook. My favorite dessert ever! I can’t wait. This muffin cake’s texture looks incredible. 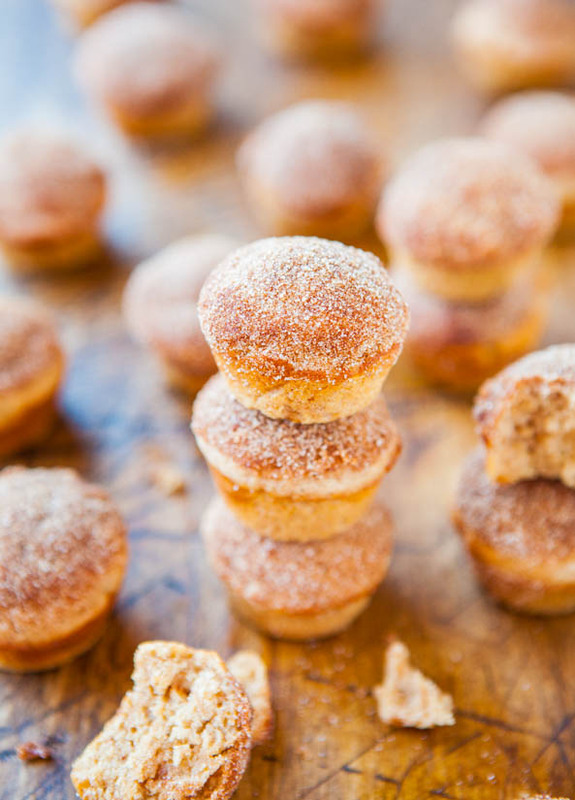 Soft, fluffy – and not to mention full of summer flavor! 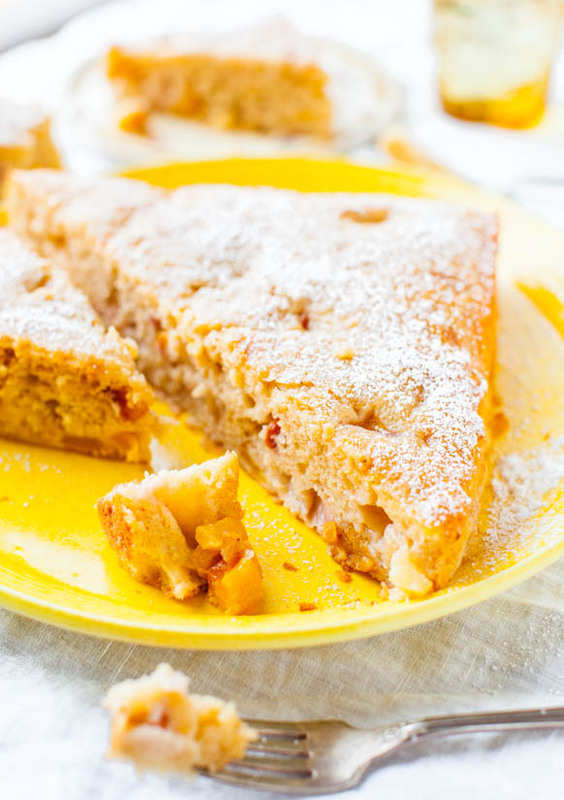 I loved the sound of your pancake cake and this is just as creative – and yes, so much easier than individual muffins! Fresh fruit is one of my favorite things to bake with. I can’t get enough of peaches and nectarines right now. Love that you piled them into this cake! It looks yummy and so perfect for summer. I get plenty of these PANICKED emails…WHILE the person’s item is in the oven baking, like I’m Live Baking Support and around to answer their question right then and there…but if I said, bake for about 30 minutes, they will write to me, It’s been 34 minutes and my toothpick isn’t coming out clean. I’m like..bake it longer then. Bake until it’s done. But you’d be surprised how many of those I get. With writing my cookbook it was very hard to convey this but then I read the Dahlia Bakery Cookbook a few months ago and he says in it, point blank, many times trained bakers or those who go to pastry/culinary school are not giving baking times. They’re given recipes, but it’s their responsibility to bake item til…it’s done. You could use frozen, too! 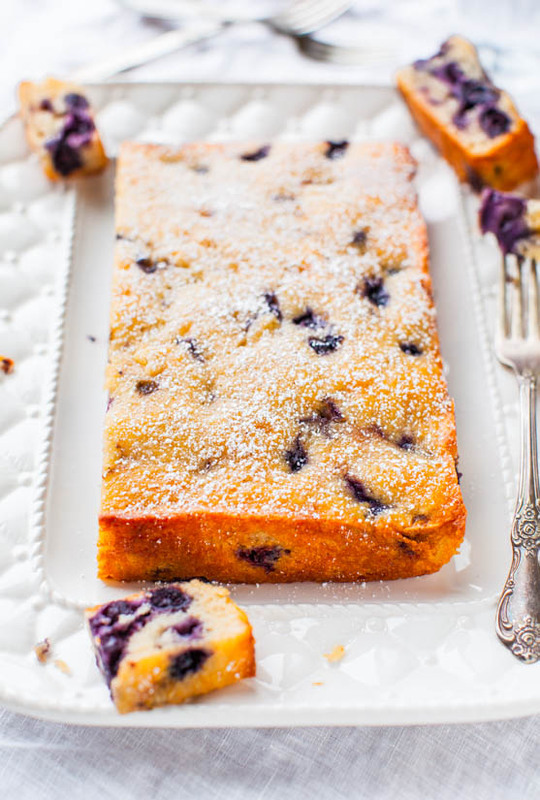 I used frozen in the blueberry cake that I made that’s identical last week https://www.averiecooks.com/2013/06/blueberry-muffin-and-buttermilk-pancakes-cake.html but I know that when I travel out of the US, sometimes frozen fruit is just as expensive if fresh! I love cake, and love peaches. 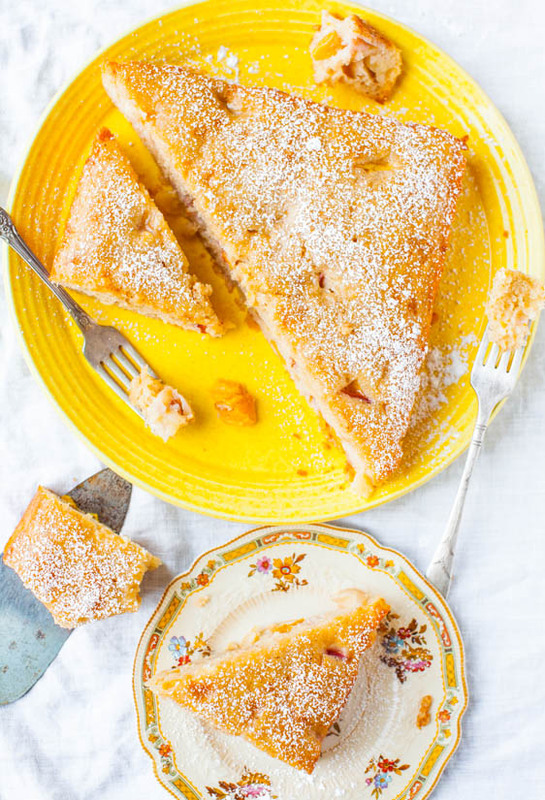 This is probably better than peach PIE! it’s pretty hard to find good peaches down here in Nova Scotia though, don’t you hate when you bite into one and its like an apple? crispy and dry. that’s not a peach! I love the idea of a muffin cake! Awesome idea. :) Peaches are so refreshing this time of year. I’m in love! This recipe sounds amazing. 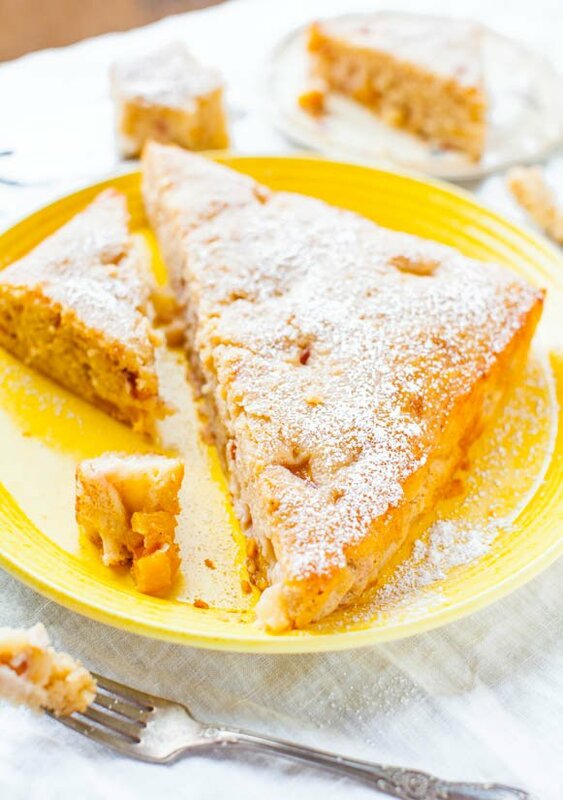 I can’t wait until Colorado peaches are at their peak, they would be perfectly awesome for this muffin cake (although I’ll have to make a special trip from MN to get them…). Thanks! I made this today. It was delicious! Thank you! Thanks for trying it, Norma! So glad it turned out deliciously for you! Delightful!! 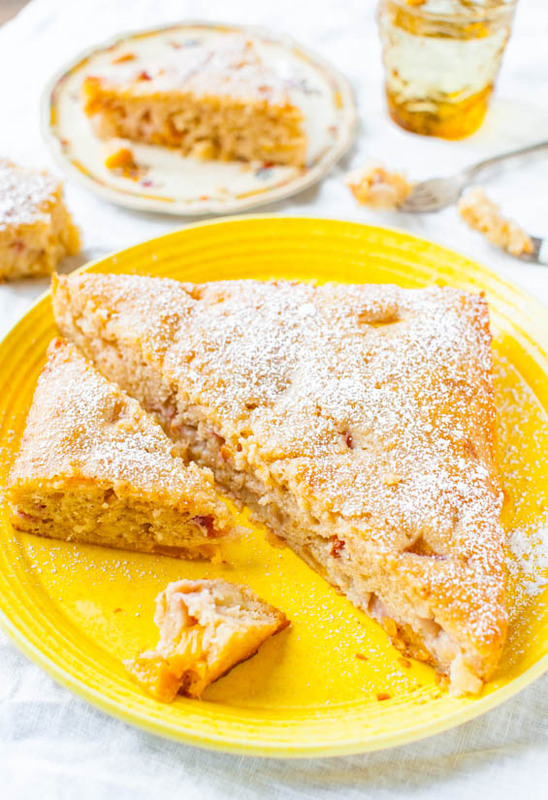 I love peach muffins, so I would just love this cake! 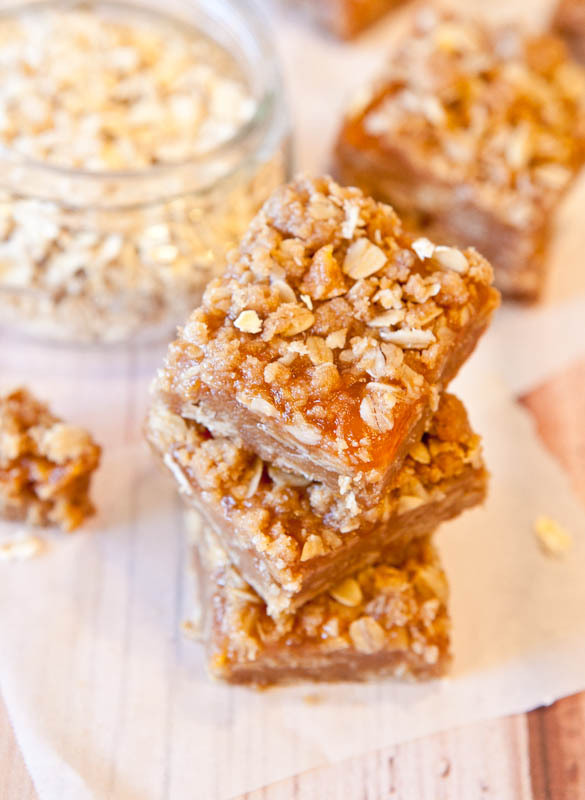 I tried this over the weekend and it is a great recipe! My boyfriend was seriously picking at it the second that it got out of the oven and continuously the two days or so it lasted – and there are only two of us! Thanks for trying the cake and for reading all the way from the Philippines! Hi, today I made your lightened up Alfredo pasta and this cake. Both turned out so well. In the past 2 weeks I made your blueberry oat bars, French cookie cake and the butterscotch cookies from your book. :) thx. P.S. would you ever consider tackling a French macaroon recipe? Thanks for saying hi, Iram, and for trying ALL these recipes – even more amazing because you have two little ones!! So glad you’re happy with everything! French macaroons…oh boy. I’ve tried. Over and over. I am convinced I’m not cut out for them, with any consistency. At least not enough to start recommending recipes to my readers. I wish I could nail them but they’re still one of those elusive treats for me! Was looking for a diff recipe & came across this one. Which, as you said, solves the problem I have of 2 deliciously ripe peaches. :) However (oh I dislike that word) – ingredient list. I don’t want to buy sour cream & buttermilk JUST to only use a small bit of it. Soooo, going to try this with that buttermilk substitute thing? Where you replace the buttermilk & baking powder with this substitute b-powder & reg milk. AND, I need to buy coconut oil for something else. Sound ok to substitute the canola oil for coconut? Do I need to adjust the amount? Going to go with your idea to substitute the sour cream with a lil carton of greek yogurt. Going to the store within 2-3 days, and I am worried about all these substitutes. Will all these changes affect the outcome? I am not as confident in baking substitutes as I am with other type of cooking, so if you could get back to me soon? I know, I know, I’m sorry. Oh, and while we’re at it? How about in my special lil cast iron skillet which bakes breads & cake so wonderfully? Canola oil is an ok sub for coconut oil, yes. And subbing sour cream with Greek yog should be fine. I wouldn’t do what you’re saying with the buttermilk and baking powder if you don’t want to buy it. I would simply pour 1/2 cup regular milk into a bowl and add 1 to 2 tbsp of lemon juice or white vinegar to it to curdle it, wait 5-10 mins, then proceed with the recipe using the curdled/soured regular milk. Good luck! Thought it was time to get back to you. Oh wow, this was soooooo good. Thank you! and I made my substitutions. I don’t think you’ve heard about Saco Buttermilk Blend. Neither had I until a year or so ago. It is truly a great product. I read about it on a post (NY Times) from someone I truly respect. Hope it is ok to link you. It was a side by side comparison. Anyways…I used the coconut oil instead of your canola oil because? I had it & you can only use coconut oil in certain kinds of things. Then when rummaging for vanilla, I found coconut extract, so there went an additional teaspoon along with the vanilla. Turns out I had 2 peaches and a plum, a little more advanced than I thought, so I cut off the bruises and added the plum. And I also discovered I had 1/2 a bag of shredded coconut. I added a few handfuls to the wet ingedients & let sit 5 mins to rehydrate before I added it to the dry ingredients. As for the Saco, I used that (2 TBSP) and 1/2 cup reg. milk. I reduced the baking powder to 1 tsp. This is all Saco adjustments ecept for the milk. They call for plain water, but I wanted the extra richness. I baked it right around 40 minutes. And when it was done? OMG was it good, It had this incredibly delicate crumb to it. No coarseness at all. (TY Saco.) And the druit managed to set inside the cake as individual pieces, no running into a slushy mess. I was a very happy camper. I WILL make again and try with different fruits. I am addicted to blackberries & when they are in season AND on sale (darn expensive) I will def, give that a try with this recipe. As for how it held up? Gone by Day 2, but the consistency had changed by then. It became dense, the delicate crumb gone. However, it was still sooooo delicious. And gone by day 2 is great. Living alone, I throw away too much food, cause the recipe made too much. 8 X 8 is perfect for me. Thank you so much for a truly great recipe. Thanks for the detailed feedback and glad this was a big winner for you! I confess. The “detailed info was as much for me as for you * your readers. And I am making it again & will need to see what & how it turned out so great, esp with the SACO buttermilk thing. I been using it in other things & I am now a convert. i keep chasing your recipes, but I do not know how to come to your site and search on a specific ‘thing’, like pineapple or peaches. Clue me in?